Lilies, rabbits, and painted eggs; the story of the Easter symbols. 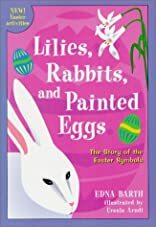 Lilies, rabbits, and painted eggs; the story of the Easter symbols. was written by Edna Barth. Lilies, rabbits, and painted eggs; the story of the Easter symbols. was published by Seabury Press.